Join members of the Southern District for their Fall Social! SORRY! 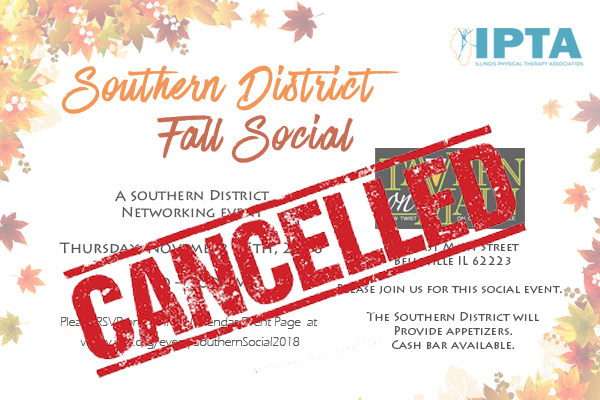 The Southern District Fall Social has been CANCELLED. Due to inclement weather, tonight’s Southern District Fall Social has been CANCELLED. Your district leaders are planning to reschedule this social, and a blast email to all members will go out at a later date. We apologize for this notice and any inconvenience. Stay tuned for upcoming networking events planned for your district. As the snow continues to fall, remember to practice safe snow shoveling techniques including lifting smaller loads and drinking plenty of fluids. The connections you make NOW in your professional career, will surprisingly help further you later on. The Southern District invites you to gather with our friends of PT, coworkers, and classmates at Tavern on Main for our fall social event! Our profession is filled with caring, entertaining and knowledgeable individuals - you never know who you will meet and what you will learn! This event is open to members and nonmembers, share this page with coworkers, students, and friends! I look forward to seeing everyone!